Family lore has it that during a yellow fever epidemic in Little Rock in the 1890s, my maternal grandmother’s family escaped the quarantined city via a flat boat, probably along the Arkansas River to the Mississippi River. The story goes that under the cover of darkness, great grandfather Nathan slipped the boat under a blockading chain across the Mississippi and spirited his wife Jennie, their children, and the rest of the family away from the outbreak. The family returned to Little Rock when the epidemic was over, and Nathan and Jennie’s daughter, Gida, my grandmother, went on to graduate from college in 1911, a rare feat for a woman in those days. Quarantine and isolation are important “social distancing” tools that help prevent the spread of infectious disease. The Centers for Disease Control and Prevention (CDC) defines isolation as the act of separating people with a contagious disease from people who are not sick. Quarantine, on the other hand, separates and restricts the movement of people who have been exposed to a contagious disease to see if they become sick. (Quarantine is usually implemented for the period of time equivalent to the incubation period of the disease of concern.) Quarantine and isolation may each be applied to an individual, group, or community. In slipping under the blockading chain across the river, grandmother’s family evacuated a “community-wide quarantine,” which is defined by real or virtual barriers, known as cordon sanitaire, around a geographic area. Isolation includes the mostly voluntary, but very important, activity of staying home from school, work, and social events when people are sick with an infectious illness. For example, isolation may be implemented on cruise ships that inadvertently host vacation-spoiling norovirus outbreaks. In an effort to control the onboard spread of the dreaded and highly contagious virus, sick passengers may be asked to remain isolated in their cabins. Yellow fever epidemics were serious events throughout history. The first US quarantine station and hospital was built in 1799 at the port of Philadelphia after a yellow fever outbreak in 1793. CDC reduced the number of quarantine stations from 55 to 8 in the 1970s based on the notion that infectious diseases were a thing of the past. Between 2004 and 2007, however, the number of quarantine stations rose to 20 based on fears of bioterrorism after the attacks of September 11, 2001, and the SARS outbreak of 2003. Modern quarantine is limited to situations involving serious, highly contagious diseases when the required resources are available. Quarantine both helps stem the spread of illness and identifies the ill for appropriate care. Although home quarantine is the preferred method of separation, designated quarantine facilities may be needed for travelers or the homeless. Quarantine may be voluntary or mandatory, with voluntary quarantine considered the preferred first option. Interestingly, experience shows quarantine does not require 100 percent compliance to be effective. The Harm Principle is met: If the disease or exposure goes unchecked, clear and measurable harm may result. This applies only to infections that are spread from person to person. Reciprocity is upheld: In return for individuals curtailing their liberties for the good of others, society has a reciprocal obligation to assist them with needs such as adequate food and shelter and psychological support. The Transparency Principle is met: Public health authorities communicate clearly the justification for their actions and allow for a process of appeal. Upshur calls quarantine a “blunt instrument” in the control of infectious diseases. Although that is true, it is satisfying to know that since my ancestors’ escape under the cordon sanitaire over a century ago, the ethics of quarantine have been quite thoroughly probed and the finer points honed for its appropriate use for public health. 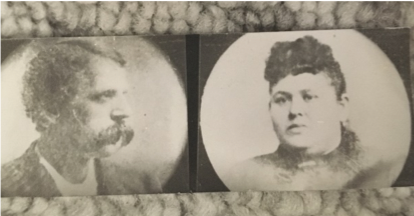 Whether you consider my great grandparents to be family heroes or public health scoundrels, their dilemma illustrates the difficult situations faced by families and public health officials in developing policy for the greater good. 2The CDC partners within the Quarantine System with several other government agencies, including U.S. Customs and Border Protection, U.S. Fish and Wildlife Service, U.S. Department of Agriculture: Animal Plant and Health Inspection Services, U.S. Coast Guard, U.S. Food and Drug Administration, U.S. Department of State, U.S. Department of Homeland Security, U.S. Department of Transportation, Federal Aviation Administration, Transportation Security Administration, and the Federal Bureau of Investigation.